The state of North Carolina is home to hundreds, if not thousands, of beautiful waterfalls, located mostly in its mountainous western area. 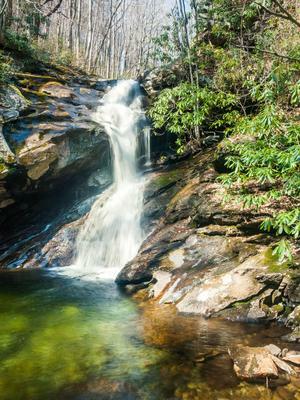 And although many different natural attractions can be found in the Southern Applachian Mountain region, waterfalls have without a doubt become one of North Carolina's most treasured outdoor resources. Shuck Ridge Creek Falls takes on an incredible clear-green hue during winter months when sunlight can reach the pool. It's a long hike to get there, but well worth it! Our interactive map. This is what most people who visit this site use to find a waterfall. The list, which is an index of all the waterfalls we know of, including pictures for easy identification. Search for it, if you already know the name of the waterfall you're looking for. Once you find it, each waterfall has its own page with all the detailed information - a photo, descriptions, directions, and trail information where available. WNCWaterfalls.info is your online guide for comprehensive information about waterfalls in North Carolina. We give you pictures, statistics, maps, directions, and links to other sites to help you find your favorite waterfall. Using this information, come explore some of the most beautiful features nature has to offer! Although we have a large number of waterfalls on the site already, we're continuously adding new waterfalls as we explore them, and improving the information on ones we've visited. Updates and trip reports can be found in the news section below. Enjoy! North Carolina's waterfalls are, unfortunately, one of the state's most deadly attractions. For various reasons, waterfalls tempt people to put themselves in gravely dangerous yet completely avoidable situations. Don't be one of them. The scene at a waterfall can be deceptive. Slippery rocks, swift currents, deep pools, and underwater hazards can lead to injury or death. Tragically, people die at North Carolina's waterfalls every year. Stay out of swift water, do not climb around falls, and do not try to cross rivers or streams upstream of waterfalls. I was recently interviewed by Elizabeth Jensen of the Smoky Mountain News for an article about waterfalls in Western NC! Read the article to see the plug for this site, quotes from myself and other great local waterfall "Gurus" such as Kevin Adams and Rich Stevenson, and a neat interactive waterfalls map! No research on the waterfalls in North Carolina would be complete without at least looking at these other venerable sources of information. First, buy a copy of Kevin Adams' book "North Carolina Waterfalls: A Hiking and Photography Guide" online (or in local bookstores). It's the most comprehensive and updated one out there. Next, check out Rich Stevenson's web site ncwaterfalls.com, the most comprehensive on the Internet. Have a book, map, or web site regarding NC's waterfalls? Contact us to let us know and we'll add your link here! Many thanks to these and other waterfall enthusiasts who have pointed us in the right direction all those times when we were out doing "field research". All of our information is available for free via a Creative Commons Attribution-Share Alike 3.0 License! What this means is that you may copy and share this information in any way you like, without having to ask. Just be sure to give credit back to WNCWaterfalls.info! where [ID] is the waterfall's numeric ID and [name] is the name of the waterfall, separated by underscores (_). Please be sure to report any errors, omissions, or comments you might have by contacting us. We hope you enjoy!